Collecting forays – Saturday, October 14, departing from the Quadra Community Centre at 9:30 a.m. returning to the QCC no later than 3:00 p.m. Guided field trips to find the greatest possible variety of mushrooms and other fungi. Identification Workshop by Dr. Shannon Berch – Sunday, October 15, Quadra Community Centre, 9:30 a.m. to 12:30 p.m. with optional Question and Answer session from 1:00 to 2:00 p.m. Note: if you wish to stay for the Q&A session, bring a lunch or snack as there will be a half hour break. 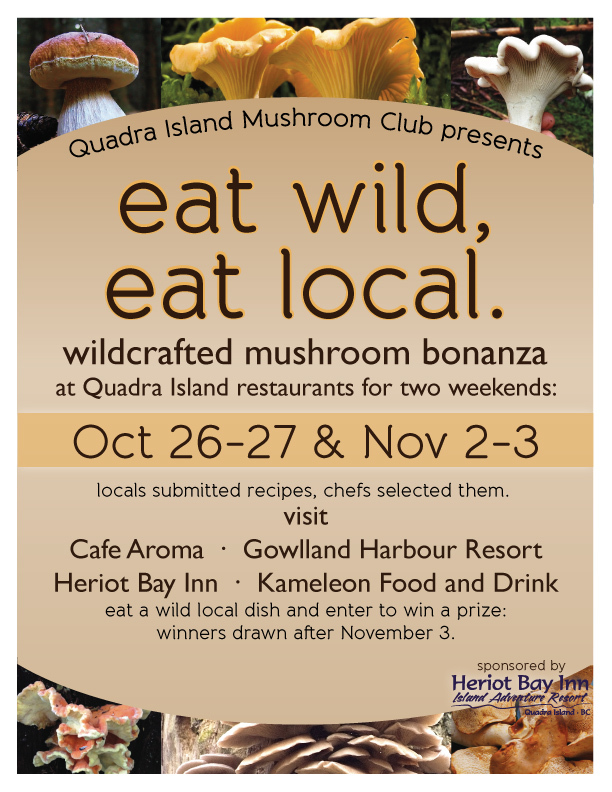 To register for one or both parts of the Festival, call the Heriot Bay Inn at 250.285.3322. Additional information (i.e. what to bring for the collecting forays) will be provided upon registration. Note: all participants in Part 2 (forays and workshop) will be required to sign the Quadra Island Outdoor Club waiver if not already members of the Club. A dozen club members and guests enjoyed the sunny if cool weather to check out the mushrooms growing along Community Centre trails. After a brief discussion about how to properly collect specimens, we headed out in two groups to collect as many types of fungi as we could find. We then assembled at Marian McMeekin’s home to eat our packed lunches and spread out our finds for identification. (We also enjoyed two mushroom appetizers – Chanterelles Ajillo (a garlicky spicy treat) and a Chanterelle/Walnut pate). With the help of Marian and Hanna Lewandowski, several mushroom field guides and the identification program “Matchmaker”, we identified a good number of the specimens found, including several edibles (pine mushrooms, chanterelles, milkcaps and honey mushrooms). It was an interesting and enjoyable day. Note: Participants must register with payment for the events so we know how many people to plan for. Contact Maureen McDowell at mcboas@gicable.com or at (250) 285-2221. Foray 1 – Saturday, October 19 – Participants must register and pay by Monday, October 14. Foray 2 – Saturday, November 2 – Participants must register and pay by Monday, October 28.